Omega Renk Bearings Private Limited: An ISO 9001:2000 Company; Leading Manufacturers of white metal lined sleeve bearing assemblies, shells, thrust & guide pads. Omega Renk Bearings Pvt. Ltd., is a leading manufacturer of white-metal lined precision journal bearings, guide pads and thrust pads, and a major supplier to RENK AG, Germany, and an acknowledged leader in precision engineering. 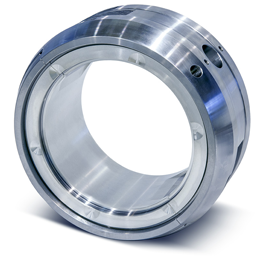 In an industry characterized by aging technology, Omega Renk Bearings stands out with one of the most modern manufacturing facilities, and has been setting benchmarks for the manufacturing industry of the future. In an industry that has shown a marked neglect of environmental concerns, Omega Renk Bearings’ eco-responsible energy policy has few parallels worldwide.